The "Double-Sided Lotus Plush w/Gel" is on the medium-soft end of the feel spectrum and is finished on both sides; lending to more durability. 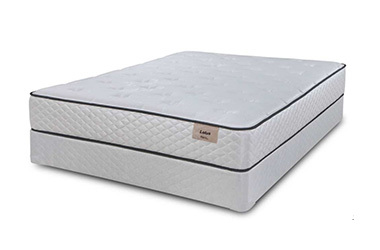 It has a gel lumbar pad on each side, features foam encased edges, has an LFK Offset Innerspring Coil System and several inches of support and comfort foam on each of its sides. The "Lotus" mattresses are a part of the Comfortec line are a great value; whether your needs are in standard sizes or custom/odd sizes. Offered at a medium-low price point, it has a lot of what are usually considered to be luxury features and components. 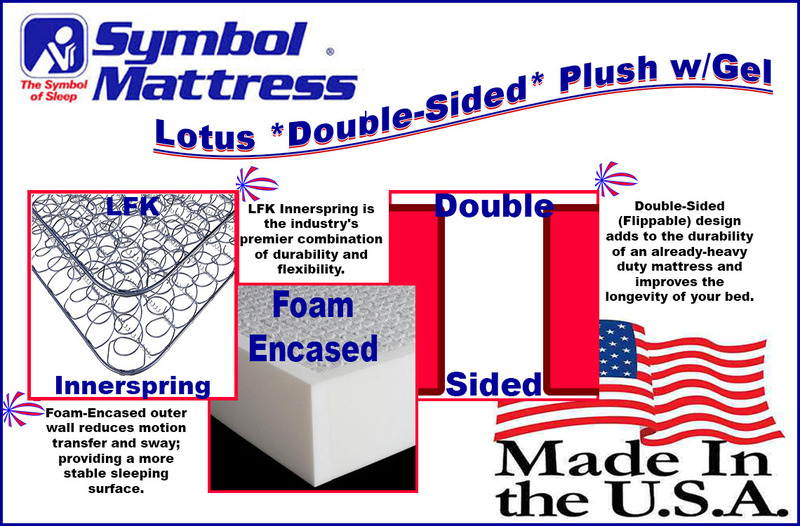 Symbol Mattress makes all of their mattresses in the USA and even creates their own mattress foam. All of their foams are CertiPUR-US certified and considered to be wholly non-toxic. A double-sided mattress offers a bit more durability than a no-flip design mattress; so long as you flip it periodically. (I recommend every season, as a reminder). This makes an even better value out of the "Double-Sided Lotus Plush with Gel". The LFK Offset Innerspring Coil Unit is arguably the best in the industry. This one has a respectable coil count but also a thicker-gauge steel composition so it's both contouring and strong. A gel lumbar pad, over time, is going to lend a bit more support to the middle-third of your body and the bed. The dense foam edges reduce motion transer (example: from a partner getting in or out of the bed) also give a more supportive and sturdy feel. There are also more than four inches of high-quality, American-Made foam on each side of the mattress - between you and the spring.